Most of us spend our campaign days eagerly devouring the latest public opinion polls, and there is no shortage of them. In the six days after the conclusion of the party conventions (through Wednesday afternoon), there have been three major national polls released — not including daily tracking surveys by Gallup, Rasmussen and Reuters/Ipsos — and 13 state-level surveys; RealClearPolitics lists 57 national polls since June 1. But polls are not predictive. As the pollsters always say, each poll is just a snapshot of an object moving in time. Moreover, the further one gets away from the actual election day, the more misleading polls can be, because it is difficult to figure out who will actually show up to vote, and many events that might influence the horserace (such as debates or crises) have not yet occurred. A better way to forecast the election results — potentially, at least — is to uncover the underlying fundamentals that propel an electorate to vote the way it does, and to combine them in some rigorous, standard fashion based on America’s voting history. Quite a number of political scientists have done so, creating models that use statistical techniques such as regression analysis — seeing how one variable, like the economy, affects another, like an election outcome — to predict presidential elections. A model should ideally be simple and elegant, using relatively few variables and constants to generate a forecast. Prof. James Campbell of the University at Buffalo, SUNY has gathered together 13 models’ forecasts for a symposium in the October edition of PS: Political Science & Politics (a journal of the American Political Science Association). With his permission, we are giving our readers a sneak peek at these forecasts, some of which are based on national data and others of which rely on state-level information. As the table shows, they vary widely, with eight of the 13 showing victory for President Obama and five seeing Mitt Romney as the next president. The chances of an Obama plurality range from a mere 10% to a definitive 88%. For whatever it is worth, the average of the models’ projected vote for President Obama (of the two-party total, excluding third-party and independent candidates) is 50.2% — a tiny advantage for Obama, but hardly ironclad. By comparison, Obama won 53.7% of the two-party vote in 2008, and 52.9% of the total popular vote (including votes cast for third-party candidates). 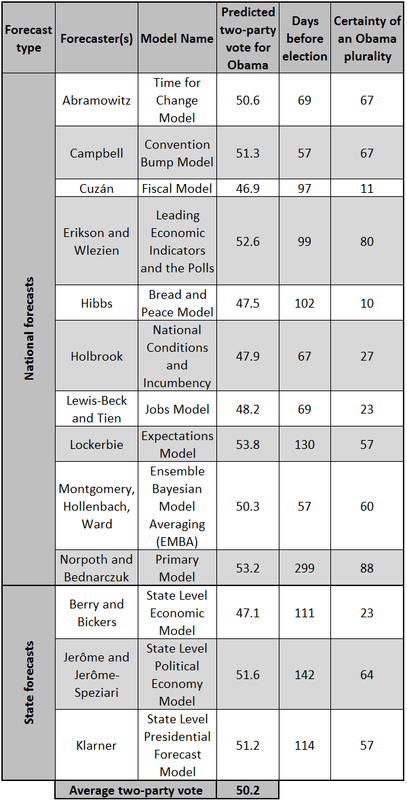 You’ll have to wait for the Campbell PS symposium, which will be online in a few weeks, to see the details and discussion of the individual models, and of course the election results will enable all of us to see which models were more correct. Source: James E. Campbell, “Forecasting the 2012 American National Elections: Editor’s Introduction,” PS: Political Science & Politics, v.45, n.4 (October 2012), forthcoming.